The Tree of Life oval pendant necklace represents something I call family jewelry, like the family tree bracelet, this attractive Tree of Life necklace reminds me of the family tree necklace pandora and makes a great gift. Tree of life jewelry symbolizes the tree jewelry meaning of a holistic jewelry connection to nature. Family tree ring, birthstone jewelry. 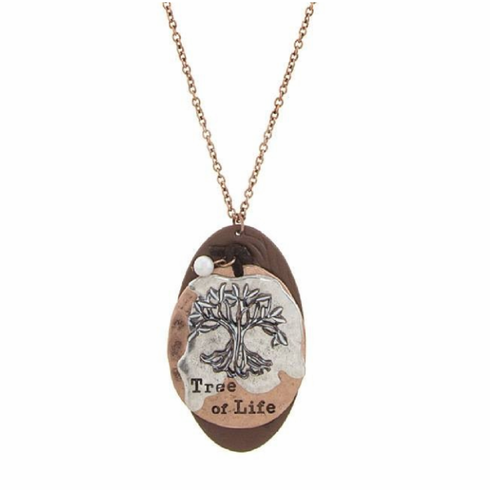 The Tree of Life necklace measures 2 inches wide, 3 inches tall with a 30-inch chain. Made of Antique copper, antique silver and leather with lobster claw clasp and three-inch extender.